The Ovation-1013 will inspire you to make large glass masterpieces. It is rugged, reliable, and designed to last. When you need speed, you can rapidly fire production loads of glass. Enjoy fusing, slumping, pate de verre, and painting in this large production kiln. Imagine making large screen prints on glass. Fire quantities of glass decals, create large paintings with frit and stringers, experiment with recycled glass. If you have been firing a smaller kiln, you will be amazed at the space inside the Ovation-1013. Fire several large projects such as bowls or platters in one load. The 33cm depth allows you to slump tall moulds. The sidewall elements, mounted in two horizontal rows of grooves, improve heat distribution near the edges of shelves. This is especially desirable for large slumping projects. The Ovation-1013 lid elements use an element groove that eliminates element pins. The element coils are wider than the groove opening, so the elements stay in place without pins. The sidewall element coils are protected in dropped, recessed grooves. The Ovation-1013 has two mechanical relays for long life. (The relays turn on the heating elements after receiving a signal from the digital controller.) The two relays last longer than the single relay of competitive kilns, because less amperage goes through each relay. 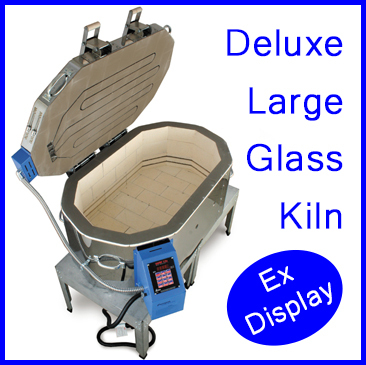 Two deluxe kiln stands with locking casters are included with the kiln. Enjoy the convenience of rolling the kiln out of the way when it is not in use. The 45cm tall stands raise the kiln to a convenient height for loading and unloading. Should you need a vent, merely slide the collection cup of an Orton vent into a mounting bracket on the top of one of the stands. The Ovation-1013 comes with a sloped control panel for easy viewing and programming. The digital keypad is mounted high in the switch box. This, combined with the tall kiln stand, brings the controller to a comfortable height. The Ovation-1013 comes with two large, tapered peepholes. 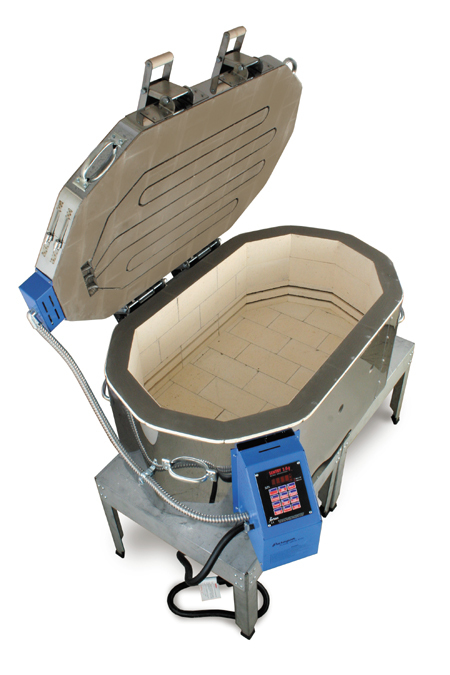 They offer a wide view of the firing chamber with little heat loss. The peepholes, both sides of the lid and top rim of sidewall firebrick are hardened and sealed with a special refractory coating to protect the ware from dust. You will be amazed at the convenience of digital firing. The reliable computer continually monitors the firing so you can spend your time productively without closely watching the kiln. (Please remember, however, to check the kiln during firing and to monitor it near the expected shutoff time.) The sealed touch pad keeps out dust and is easy to wipe clean. Do you ever wonder how much electricity your kiln uses? The digital controller can figure this for you with the press of a button. Find out how little a kiln actually costs to fire. 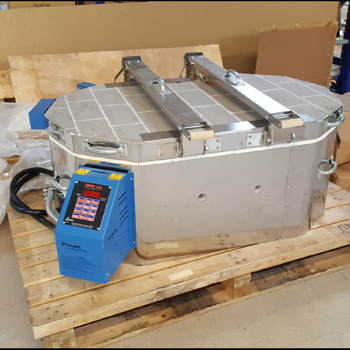 Wires are fastened to the heating elements with heat-dissipating connectors that have been refined and proven over many years in Paragon kilns. Elements are coiled from the finest high-temperature wire available. The thermocouple, which measures heat inside the kiln, is protected with a high-nickel stainless steel sheath for long life. 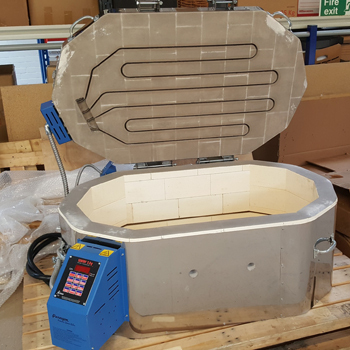 No furntiure kit is included with this kiln. Please choose the shelves and props you require separately.